Covey Oboes: the finest oboes available, oboe cane, tube cane, reeds, reed-making tools, knives, sharpening stones, and accessoriesfor the professional and student oboist. Our shop is located 2 hours north of Atlanta, in Blairsville, GA.
We are usually in the shop M-F from about 10:00 a.m. to about 6:00 p.m. If we're back in the oboe machine room, we sometimes can't get to the phone, so please try again later. Shawna Lake, at OboeChicago (our dealer), 847-815-9644, can answer many questions you may have. All visits are by appointment only. If you'd like to visit, please e-mail us first and we will arrange for a mutually convenient time. We are currently finishing and delivering new Covey oboes, both Grenadilla wood and Rosewood, and have more in the "pipeline" for the rest of the year! If you are interested in trying a new Covey, please call Shawna and make arrangements! 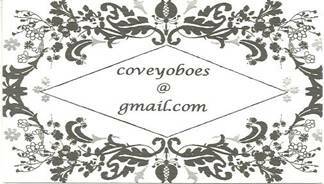 Our goal and commitment is to make and deliver to our potential Covey oboists the most beautiful oboe possible. Whether that means first-rate repair or fine-tuning your oboe, our commitment is to offer you our best support!